Jason Clay and Matt Belzil! 2017 Jack Link's Lake Simcoe Open Champions! Congratulations guys! We welcome you both as you join an exclusive group and become a part of our tournament's history. 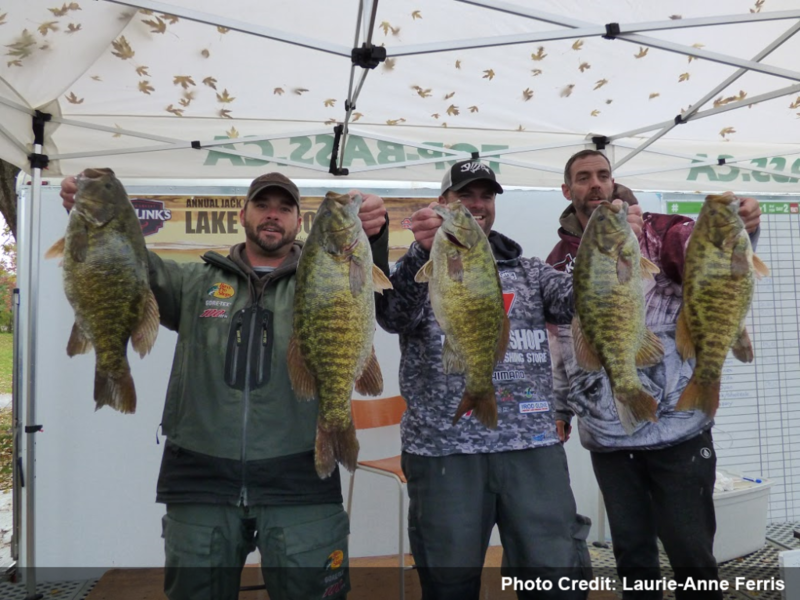 On Saturday October 28, 2017 in Orillia Ontario, The Aurora Bassmasters Hosted one of Canada’s Premier One Day Bass Fishing Events. The Jack Link's Lake Simcoe Open! 47 teams braved the tough rain and weather conditions for a chance at being 1st place winners of our Lake Simcoe Open! Jason and Matt braved the wind and rain to push the scales over the previous Canadian Record to 31.80 lbs with 5 Big Smallmouth Bass! Way to go guys! Close on their heels was a very respectful weight by Ryan and Callum Johnson with 30.86 lbs. In third place was Sebastien Roy and Steve Rowbotham with 30.13 lbs! It was a very impressive podium with the first three teams all weighing fish over 30 pounds! After 16 years, the Aurora BassMasters are still hosting this event but is only made possible with the very Generous Sponsorship and Donations made for our anglers. We at Aurora Bass are very proud to be a part of this tournament, it's always promised to be a great time for all our anglers. We've seen many great things over the last 16 years, including many records being broken! We look forward to continuing hosting this event for many more years to come. To everyone who was a part of our event, thank you for making this tournament a great success every year! With the support of our sponsors, dedicated anglers and volunteers, the best is yet to come.